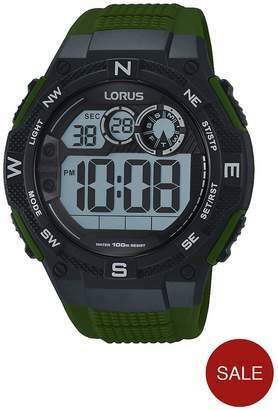 Lorus Lorus Black Digital Dial Black Silicone Strap Mens Watch Lorus Digital watch on a Khaki polyurethane strap. Features include Time/calendar display with hour, minute, second, month, date & day of week. 12/24 hour format. Stopwatch measures up to 23 hours 59 minutes and 59 seconds in 1/100-second increments. Split time available. Countdown timer. Backlight. 100m WR.